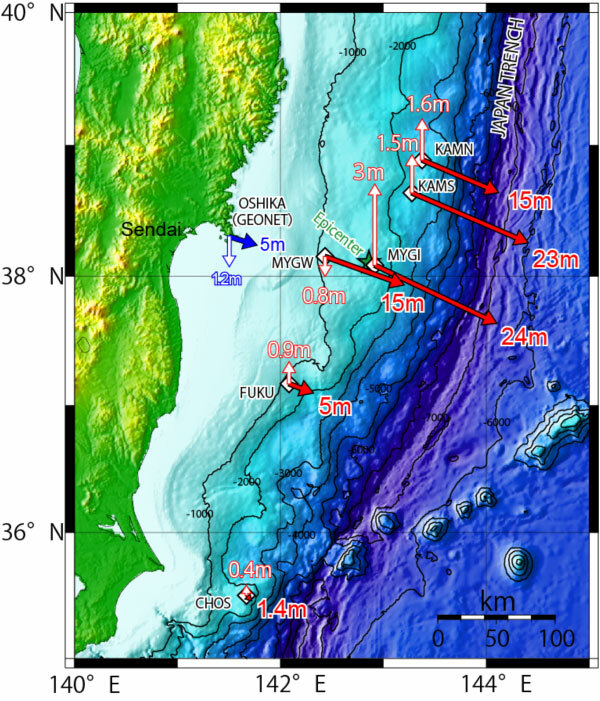 The forces of the Japanese Tohoku-oki 2011 magnitude 9.0 earthquake, the fifth most powerful in the past century, set off a large tsunami that further devastated the shaken island. The earthquake and tsunami also badly damaged a six-reactor nuclear power plant in Fukushima, located 241 kilometers north of Tokyo. The backup generators that powered its cooling systems were destroyed, causing a dangerous release of radiation. The quake and the tsunami claimed the lives of thousands of people. This earthquake occurred on the boundary between the Pacific and Okhotsk tectonic plates where the Pacific plate is diving beneath the island of Japan. The earthquake epicenter was located off of the east coast of Japan.. The Pacific plate is diving beneath the island of Japan, and the epicenter was located off of the east coast. During an earthquake, the largest displacement of the surface of the earth generally happens above the epicenter, and decreases with distance away. 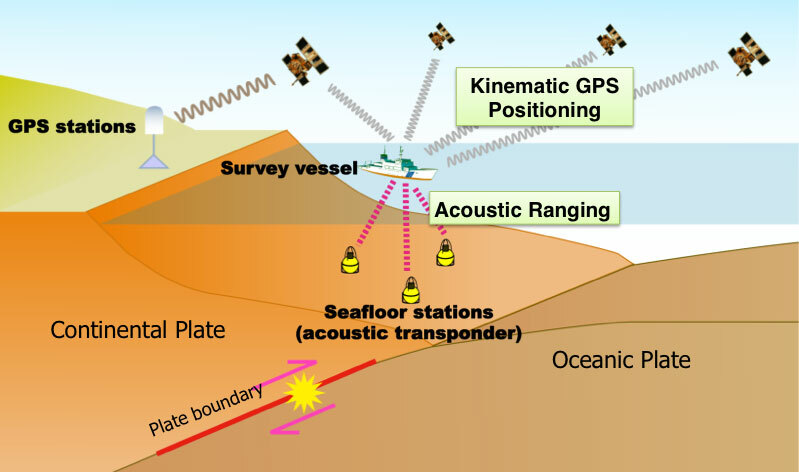 In large subduction zone earthquakes, the closest GPS measurement of slip is made on shore, while the epicenter is located offshore. Therefore it is difficult to accurately assess the largest displacement during a subduction zone earthquake. 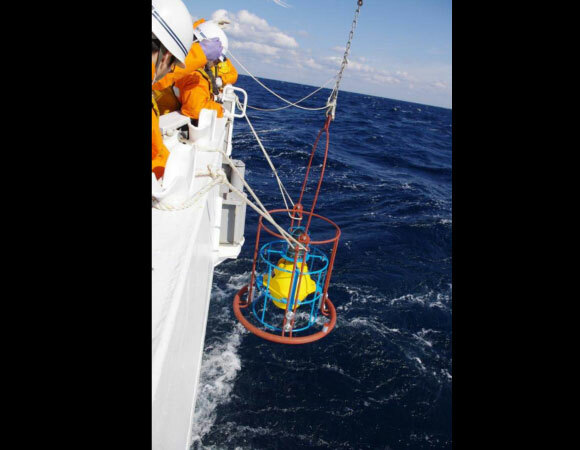 Researchers at the Japan Coast Guard have been using offshore GPS and acoustic measurements to more accurately assess surface motion during earthquakes. In this survey, the same sites are occupied at a set interval of time to see how much an individual site has moved. 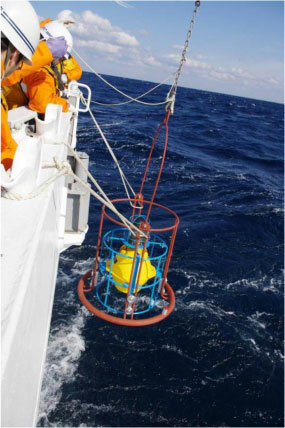 The Tohoku-oki earthquake provided the means to test the advantages of offshore measurements. Initial estimates detected the largest land displacements of five meters horizontally (in the direction of ESE) and one meter of subsidence at the Oshika peninsula, located about 130 kilometers from the epicenter. Researchers used these measurements to estimate a maximum fault slip of 20-30 meters at the epicenter, meaning there should have been even more motion of the ocean floor above the epicenter. 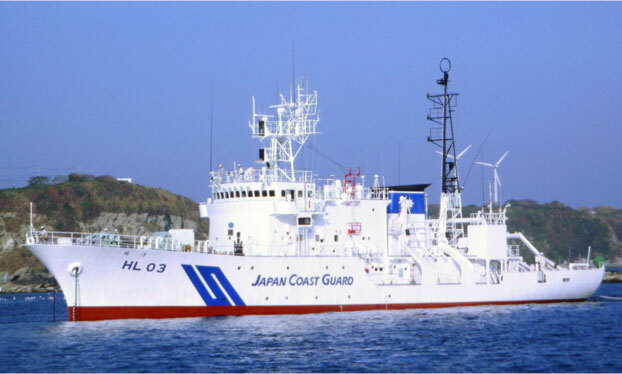 However, researcher Tadashi Ishikawa was able to reoccupy five GPS/acoustic sites in the vicinity of the epicenter that he had surveyed approximately three times per year between 2000 and 2011. He was able to detect a seafloor movement of 24 meters ESE and a rise of three meters at the site closest to the epicenter. 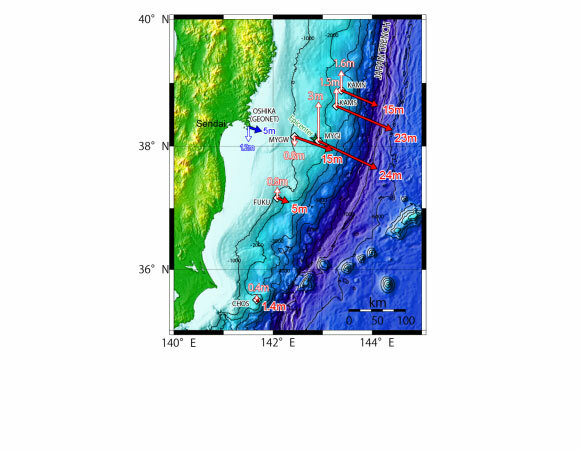 Ishikawa believes these results invalidate the initial estimates of maximum fault slip of 20-30 meters between the Pacific and Okhotsk plates, because the fault slip should exceed any motion observed at the surface. Seafloor geodesy and acoustic measurements have the potential to more accurately measure movement above the epicenter of a subduction zone earthquake, leading to better models of fault movement. Figure 1. 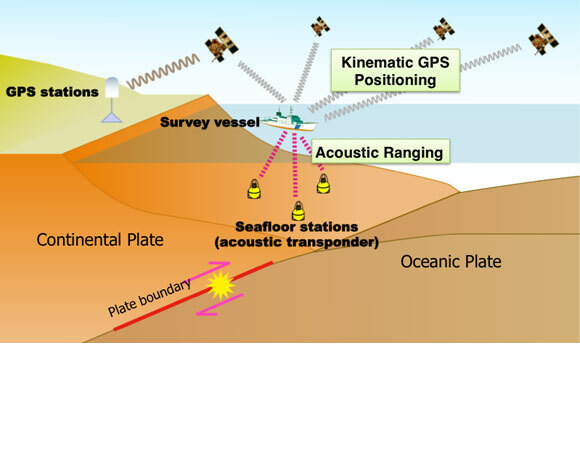 Schematic picture of GPS/Acoustic seafloor geodetic observation system. Figure courtesy of Tadashi Ishikawa. Figure 2. 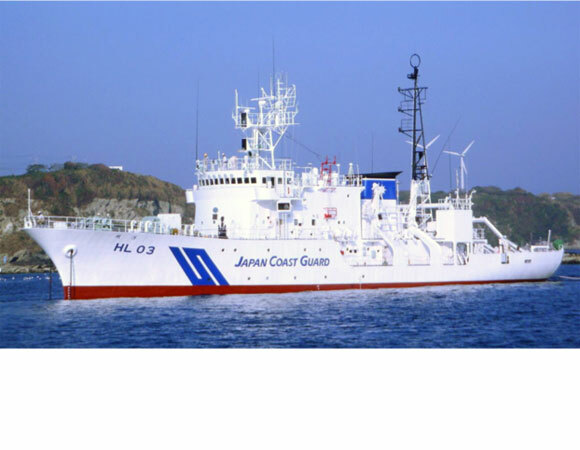 Survey vessel MEIYO, one of the three vessels which we used for this observation. These vessels have a mast GPS antenna for kinematic GPS positioning and a hull mounted acoustic transducer for underwater acoustic ranging. Figure courtesy of Tadashi Ishikawa. Figure 3. Installation of acoustic transponder. Figure courtesy of Tadashi Ishikawa. Figure 4. Coseismic displacements associated with the 2011 Tohoku-Oki earthquake. Figure courtesy of Tadashi Ishikawa. Sato, Mariko; Ishikawa, Tadashi; Ujihara, Naoto; Yoshida, Shigeru; Fujita, Masayuki; Mochizuki, Masashi; Asada, Akira. Displacement Above the Hypocenter of the 2011 Tohoku-Oki Earthquake. Science, Volume 332, Issue 6036, pp. 1395- (2011).